World demand for beef is increasing more rapidly than supply, which grew at only 2.3 percent a year in the decade 1963–72. With few exceptions, this is true of both developed and developing countries. In the coming decade there is every reason to expect an increasing gap between supply and demand for this commodity. Associated with the growing world shortage, the progressive increases in market prices (4.5 percent per year over 1963–72) are offering better opportunities to public and private investors to embark on more intensive forms of beef production. Many of the traditional agricultural export commodities of the developing countries have been difficult to place on the world market at fair and regular prices. These uncertainties have induced governments to look for other exportable products, and beef is certainly one that offers a promising future. P. Auriol is Beef Cattle Production Officer in the Animal Production and Health Division, FAO, Rome. While in the developed countries production of quality beef is usually achieved through the feeding of high-energy rations to young animals (6 to 30 months old), the bulk of the beef produced in the developing countries still comes from rather extensive systems. The main systems of production, and various combinations of them, can be identified as follows. The breeding, raising, growing and finishing activities are operated by the same people on virtually the same grazings in extensive systems of beef production. This occurs in most of the pastoralist areas of Africa and is also adopted by some ranchers in Latin America. Under this system meat is often a by-product of milk production, and beef output may be as low as 7 kg per hectare per year on a carcass basis; acceptable carcass weights (equal to or above 150 kg) can only be achieved when steers are 5 years or older. The animals stay in good condition for only 3–4 months of the year following the end of the rainy season. The small gain accumulated in these months is often partly lost (up to 25 percent) when stock are trekked over several hundred kilometres to slaughterhouses, which are usually located near large urban centres. However, in such a system the production costs, except those for watering the animals, are practically nil. In the past this was the traditional system of beef production in many parts of Europe. Small farmers kept young males and some culled heifers for feeding and finishing, and fed them on home-grown fodder. Fattening and finishing of work oxen was also an important source of beef. 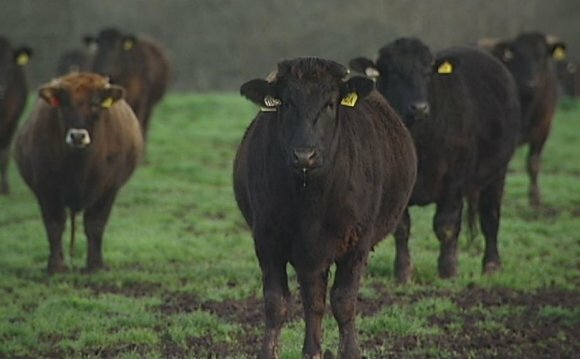 Under the mixed farming systems practised today, the feeder cattle are usually, but not always, produced on specialized breeding and raising farms located on poorer land or land unsuited to intensive farming. Under these systems specialists, not necessarily farmers, undertake the last phases of the beef production chain-feeding and finishing. The systems vary according to the principal feed ingredient used: grass, fodder, silage, grain, or industrial by-products. The operation of growingfinishing activities independently of breeding and rearing leads to job specialization, which is usually accompanied by a zoning of the beef industry as a whole. The breeding-rearing phase may be linked to dairy production. With a few exceptions such as Argentina, southern Brazil and northeastern Mexico, there is no significant specialized growing-finishing beef industry in the developing countries. There are several reasons for this. One is that, until recently, traditional or nonspecialized beef production has been able to cope with the rather low internal demand for meat, and sometimes also with the demands of a significant export market. Also, for social and historical reasons, livestock-keeping communities have often been kept apart from the general run of country development, and in many cases are not used to farming. They generally inhabit areas where the climate precludes cropping. Likewise, traditional farmers are often not interested in livestock raising and could not produce, with their limited resources, both food for their family and feed for animals. Cargill Meat Solutions is one of the numerous platforms of Cargill Incorporated. The corporate office is located in Wichita, Kansas. The meat products included in operation are pork, turkey, beef, further processing and case ready.